At Sandmeyer Steel Company we are committed to providing our customers the most efficient and cost-effective methods of cutting Stainless Steel and Nickel Alloy Plate and plate products. In addition to our already diverse capabilities of plate processing, we are now offering multiple abrasive waterjet cutting systems to address your cutting needs. Our two WMC Series machines feature four cutting heads, integrated abrasive removal and recycling systems, WindowsT-based PC machine control and programing, and 60,000 psi pumps. Our dual-headed 87,000 psi HyperPressure Technology system pushes the waterjet velocity beyond Mach 3 increasing its cutting speed by up to 50%. Our customers benefit with increased capacity and reduced cycle time, resulting in faster deliveries of processed parts. Sandmeyer’s abrasive waterjet cutting system can provide near-net shapes and intricate parts cut to the accuracy levels and close tolerances our customers require. Secondary finishing can now be minimized if not totally eliminated. Unlike other cutting processes, Sandmeyer’s abrasive waterjet cutting system assures you of receiving consistent superior edge quality with no heat-effected zone. The lack of a heat-effected zone enables us to nest patterns more closely providing better material yields for you the customer. Our four machines with seven cutting heads and custom-designed water tables allow us to cut sizes ranging from your smallest parts up to pattern sizes of 160” (4064mm) x 240” (6096mm) on our standard machines and 156” (3962mm) x 288” (7315mm) on our five-axis system. We can cut pieces up to 6.0” (152.4mm) thick and weighing up to 20,000 pounds. Don’t compromise. Get the “edge you need” from Sandmeyer Steel Company, the premier plate processor in the Stainless Steel and Nickel Alloy Plate and plate product business. Near net-shape parts of virtually any size Sandmeyer's abrasive waterjet cutting system can provide near net-shapes and intricate parts cut to the accuracy levels and close tolerances you require. Secondary finishing can now be minimized if not totally eliminated. 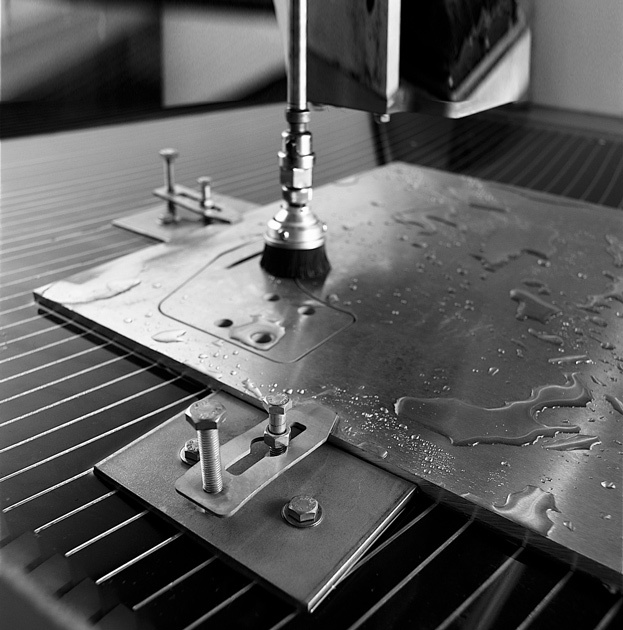 Unlike other cutting processes, Sandmeyer's abrasive waterjet cutting system assures you of receiving consistent superior edge quality with no heat-affected zone. The lack of a heat-affected zone enables Sandmeyer to nest patterns more closely providing better material yields for you, the customer. Our four machines with seven cutting heads and custom-designed water tables allow us to cut sizes ranging from your smallest parts up to pattern sizes of 160" x 240" (4064mm x 6096mm). We can cut pieces up to 6.0" (152.4mm) and weighing up to 20,000 pounds. Get the edge you need from Sandmeyer So don't compromise. Get the "edge you need" from Sandmeyer Steel Company, the premier plate processor in the Stainless Steel and Nickel Alloy Plate and plate product business.